On wlan0 everything should work the same as on eth0. So indeed weird. 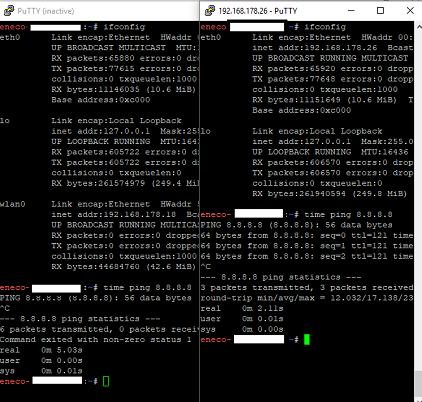 Can you post your /etc/resolv.conf and the output from "ip route" and "ip addr" when on wlan0? I thought it would/should work with just wlan0 as well so it took some time to catch what was going on. When I plug in a cable, wlan0 disappears and I can ping or connect outside. When only on wlan I can ping local resources but nothing goes outside. I'll check my local network later today and see if it is something I misconfigured somewhere even though I haven't changed anything in the last weeks. If you can ping local resource,.. can you ping the gateway also? If yes, then there is really something on your router blocking your toon on wifi to go to the internet. If you can't ping your router (but you can ping other local resources, and you can ping the router with lan cable connected) then there could be a ARP related issue on the toon (not see earlier on a toon 1). Last weekend I finally rooted a second hand Toon (thanks to martenjacob's ToonRooter). After some booting the screen kept on saying "Voltooi de installatie (etc)", so I looked around a bit on the forum and read something about reinstalling qt-gui. The removal of the gui went fine, but now there is nothing to reinstall! I rooted the device again and again, but no gui.. The Toon boots normally, but the loading bar beneath the T-logo hangs at about 35-40% and doesn't progress. Is the missing qt-gui the problem or is there something else f*cked? I tried searching for a replacement qt-gui ipk, but couldn't find it anywhere. The update-rooted.sh-script by IgorYbema also did nothing for me, so I'm a bit out of ideas. Is there a way to completely reinstall it like a brand new Eneco device? Or are there other ways to reinstall qt-gui and get the device to complete te boot process and make use of the device? SSH access works fine, so I can propbly do anything from there. If you know what you are doing it is easily to restore the qt-gui from the eneco servers. You only need a working VPN towards eneco and a working opkg repo. I bought a secondhand toon. The only thing working is Gas/stoom checks day and wheeks. Seller told me the toon is rooted. Is there a way to check without opening it? Hmm, I think I did something wrong. The Toon now only shows the logo when booting up, and nothing more. Tried rerooting it again, it still won't boor properly. It even doesn't connect to my router wit a network cable attached. So no SSH-ing to see what it is doing. Have I completely bricked it now? Or is there still a chance that it will live again? I still can connect it with my Raspberry Pi 3, so I probably can upload anything to it..
As I said, if you know what you are doing it is easily fixed. All manuals are on the forum for that. From what I read from your posts you are not in control about what you are doing. For example, when then Toon is in the activation-wizard screen it is only one simple edit in a file which would have given you a perfectly working Toon. But you managed to destroy it with removing qt-gui. No he didn`t and don`t answer the question, i ask him. The Toon is connect to wifi but nothing works like buienradar, only the message that it cant connect to service centre or something like that. A rooted toon without you knowing the password is not rooted for me You will need to root it again to gain a password. Without a root password, you can do nothing on Toon. Just opening it, connect the wires on a 3v3 usb and and remove current password and add you're own. Seller finally answered, he thought there was no password. But with putty and login as root the access is blocked. Is there a description how to change the password?